For the first time in more than 50 years, trolley cars – a few of them, at least – will be rolling down the streets of St. Louis. 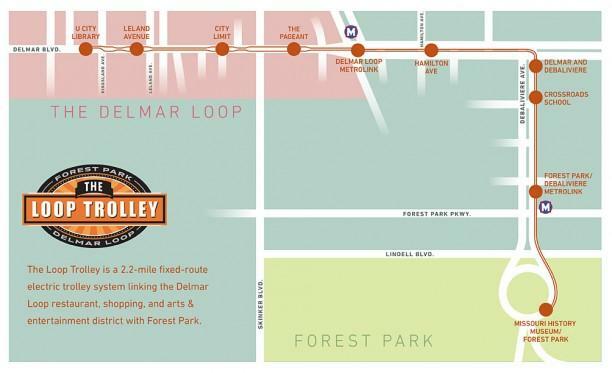 Construction on the Loop Trolley’s 2.2-mile stretch between Forest Park and University City wrapped up in November and, according to trolley officials, test runs on Delmar Boulevard and DeBaliviere Avenue are set to begin in the next week or so. A conventional truck will first tug the replica vintage trolley cars, 001 and 002, along the single track to check for clearances and platform heights. Full service is projected to begin in early summer once conductors complete training to operate the streetcars, which are powered by 600-volt electric cables suspended above the busy commercial and entertainment district’s streets. The operation also will need regulatory approval from the Federal Transit Administration and the Missouri Department of Transportation before rolling out. For more than a century, St. Louis boasted dozens of trolley lines that shuttled generations of residents and visitors across the metro area. The city’s most well-known cultural link to trolleys can be found in the film Meet Me in St. Louis and its musical number “The Trolley Song,” during which Judy Garland hops a trolley on its way to the construction site of the 1904 World’s Fair in Forest Park. Nostalgia for trolleys appears to have a strong hold on Americans. In the last decade, nearly a dozen other U.S. cities, including Cincinnati; Portland, Oregon; Tucson, Arizona; and Kansas City have laid down streetcar tracks, with varying degrees of success. Barbeau, 32, said the nonprofit Loop Trolley Company will be working on a three-year timeline to determine what’s working and what needs adjustments. Who will ride — and at what cost? Ridership in the first year is estimated at about 340,000, but that number could change based on when full service actually begins, Barbeau said. The trolleys were initially expected to roll out this spring. Fare prices have not been settled, either, although most trolley officials have indicated rates will be comparable to Metro Transit tickets. Barbeau declined to say what percentage of operating costs are expected to be covered by ticket sales. The trolley’s largest source of money is a 1 percent sales tax paid by customers of businesses along the Loop Trolley Transportation District. Barbeau explained that the financial success of the trolley line will depend on how much it helps attract business and spur economic development in the already-bustling district. “We’re starting to see development, business interests, economic improvement stretch east towards towards DeBalviere Avenue where the trolley will turn towards Forest Park. So economic development is a big positive, an advantage for this project,” he said. Advertising and fundraising also will fund trolley operations. As cities across the U.S. have shown renewed interest and investment in public transit, Barbeau said he hopes the Loop Trolley will hopefully inspire greater public support for expanding light rail in the St. Louis region.